Tickets are now on sale for two of the larger races on tap featuring Northeastern talent this fall. The Pullen Heavy Industries 400 weekend is set for Septemeber 23rd-25th at Beech Ridge Motor Speedway and will be the biggest IBG-PASS event of the year. Open shows for two-barrel pro stocks / late models, an open street stock race, PASS Modifieds and other divisions will also make up the weekend. Special perks are available for early ticket purchasers. For more information, please click here. Also on sale are advance tickets for the North vs. South Shootout at Concord Motorsport Park. The annual event is an open show featuring top names from Southern and Northern modifieds. For more information, please click here. Maine, Alaska, Mississippi, Montana, North Dakota, Rhode Island and Wyoming have never before hosted a USAC event. Those are the only states in the Union that can claim that. But after this weekend, you can drop Maine from the list. The USAC Ford Focus Midgets will make an appearance Saturday night at Oxford Plains Speedway. GEORGE AND #0 PART WAYS? After spending several years together, it appears that the pairing of Nevin George and the #0 Ralph Solhem team might be considering a split. George crashed out early at Riverhead after getting caught on the outside of another car in turn two. In the Seekonk race before that, he sat out of the #0 car to prepare for the Roush Racing "Gong Show" at Martinsville Speedway. There is also no word on what are the plans for Solhem's Busch North car, the #00 entry. George has driven the car in the NHIS races in recent seasons. 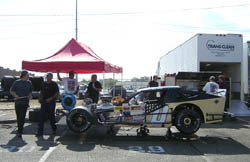 Fellow Modified Tour driver Donny Lia tested the machine earlier this summer at the NHIS track. NICE TO MEET YOU, NOW LET'S WIN! 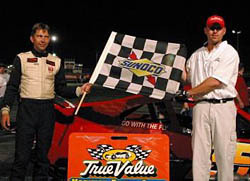 The True Value Modified Racing Series competed this weekend and for the first time in awhile, someone other than Kirk Alexander was in victory lane at the end of the night. George will not drive the #0 car in the NASCAR Whelen Modified Tour event at Stafford on Friday night. The team has apparantly withdrawn their entry from the race to repair damage from a crash last weekend at Riverhead. George and the #0 team have been quick, but luckless, for much of the past two seasons. They won last year's Tour race at Beech Ridge and have done some impressive things together this season, such as finish tenth at New Hampshire after a crash in practice after a valve stem broke. The team worked into the night to repair their only car for the race. David Pinkham in victory lane at Beech Ridge. Alexander had won eight of the first 10 TVMRS events, but David Pinkham was the surprise winner at Beech Ridge. Pinkham had won the 1988 and 1989 modified track championships at Beech Ridge and a few years ago was the driver for David Bath's Pro Stock at the track, but he has been mostly idle in the past few seasons. Pinkham hooked up with the #25 Gary Casella team for the race and had never met the pit crew before signing into the track that afternoon. At the end of the night, the team showed that they had instant chemistry as Pinkham held off the ageless Bob Polverari for the victory. The TVMRS visits Star Speedway (NH) this Saturday night.